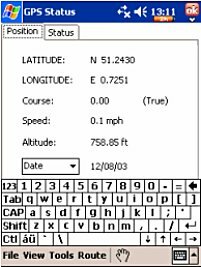 This product is part of Teletype "World Navigator" series which includes aviation, marine and street coverage, world wide version 092003. The package tested comprised 4 CD's with street level coverage for ALL of Europe as well as a world wide airport database. This is a DUAL system, operating on Desktop and Laptop PC's (Windows 2000, Windows XP Home, Windows XP Pro) as well as Pocket PC's (Windows CE, Pocket PC 2002/2003). My Laptop actually operated fine using Windows ME but this is not officially supported by TeleType. 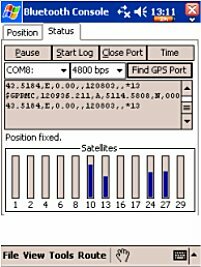 The majority of field work used an iPAQ 2210 and an Emtac CRUX BT GPS receiver. This comprehensive package is currently available at $224 for the software and $559 including a CF GPS receiver and booster antenna (Teletype 1851). The process of loading the program and maps to the PC worked as per instructions, however a separate step was required to transfer these to the Pocket PC using the Transfer menu. Loading the PDA with maps, I had problems initially and I had to consult Teletype's help. The service was very friendly and prompt and by placing the aero data file in PDA memory rather than CF card solved the problem. I found that the best place to start was on the PC where most of the features can be explored including street level planning and flights. 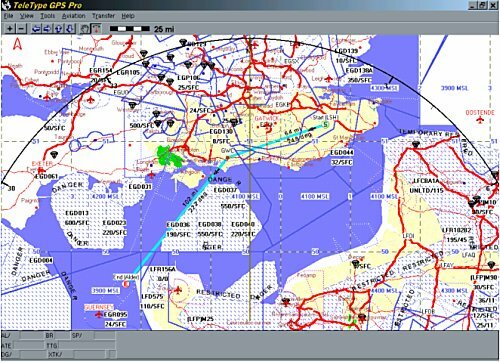 The above illustration is of the PC Aviation screen with England and France loaded and a course plotted from Headcorn in Kent to Alderney via Goodwood, to avoid restricted areas. Controlled areas, major airports and navaids are clearly shown as are major highways, cities, waterways and coast. In street mode, the load in view function provides street level detail for the entire screen. 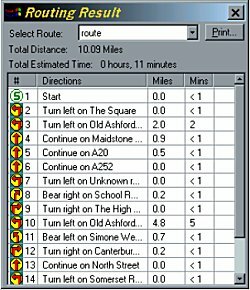 The find function will accept an address for route start and finish and an OK click selects the route on the map and as a turn by turn listing. The quickest test route from Lenham, Kent to Ashford actually diverts from the A20 and explores the village of Charing. - not the normal or fastest way. Options include quickest or shortest path. Whilst roundabouts are treated correctly on the map the directions and commands cannot handle them. Indicated change in direction, both visual and verbal, is restricted to turns only. The PDA functions are very similar to the PC, with menu driven map selection and navigation mode. In street mode, the planning process is very simple once start and finish points have been found. Many of the features for indicating turns, now familiar to us, are available with Teletype. These include bold arrows, distance and time indicators as well as spoken commands. The voice options include natural and synthesised male, female, child, aged male and aged female, using the fonix system but confined to turns and street names (not road numbers). The system will get you there, with timely signals and voice warnings accompanied by a warning ding at each intersection. However the same problems of unlikely routing and roundabout handling are still there. 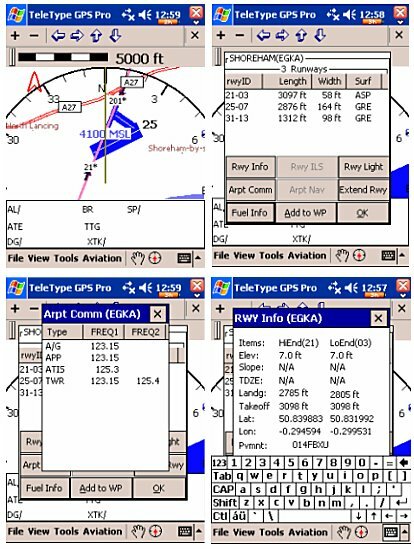 Firstly the airport database provides runway diagrams and full information on runway length and width as well as communications and navigation aid frequencies, fuel etc. An extended runway line is available enabling the pilot to line up on his approach. The downside is that, for Europe, the database is incomplete, with minor airports not included. It is therefore necessary to input the missing airfields as waypoints, as in our plan from Headcorn to Alderney. The deficiency is more important with the nearest airport function where your nearest emergency landing may not be correct. Teletype advise that the database is revised on a quarterly basis. 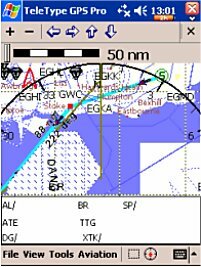 Flight planning is simply a matter of selecting the start airport, and VOR or other radio beacon as well as any other waypoints required. The multi-leg plan will then appear as a table giving bearing and distance and as a clear green trace on the map. An alternative, aeroplane shaped, position indicator will mark position with a line indicating direction of travel. Additional data is displayed at the bottom of the screen. Including height, speed, bearing, distance to next waypoint. Simply zoom to the level of detail required and the moving map will continue with plane position and data. Map detail is OK but in aviation mode you are restricted to town names with no topographical details, railways, elevation etc. in the European version. The altitude relief map option is currently only available in the USA. Railways and other street information is available in the Street Maps, and you can switch back to this, but for aviation use you will predominately want to use the aviation maps. Setting up the GPS system was simple. The Teletype CF receiver worked as default and the EMTAC BT responded immediately COM8 hade been selected and port opened. A synthetic voice announces when the position is fixed and you are ready to navigate. The excellent feature of localised loading allows selective loading and viewing of maps as your journey progresses. Local maps, therefore, will not appear until your GPS position is found. Similarly, place names will not appear until you have used the 'find' function. I.e. 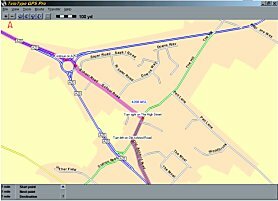 you need to find a location in the specific mapping area before names are displayed. The voice recognition function allows a specified list of commands to be learned by the program and then by pressing a designated PDA button and speaking the command the function will activate. E.g. Zoom into the view, center my position, find emergency landing airport. I can see why TeleType have done this, as having voice recognition activated at all times would slow down the application and PDA quite substantially however, in practice, I am not too happy about the safety aspects of button pressing when driving or flying and have not significantly evaluated this feature. Over 1 million points of interest are said to be included. These can be located using the find function. This version includes a pan function which allows you to tap and drag with finger or pointer to alter the area viewed. Address book integration works well. Using the 'find' function the address book option shows a thumbnail of addresses for touch selection. Sunrise/sunset time can be displayed for any point by touching the display and selecting the option. The flight utilities, including weight and balance, aircraft check lists etc. have not yet been evaluated. We decided to test fly Teletype on a triangular course from our base airport (Headcorn- EGKH) via a waypoint (WP1), then via Ashford (WP2) and back to base. As EGKH was not listed in the database, the Airport NDB (LSH) (non-directional beacon) was selected as the start and the 2 waypoints marked in a flight plan. 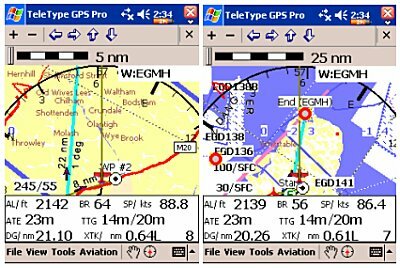 The plan in the first two screenshots above shows the direction and distance of each leg with the route superimposed on the aeronautical topographical screen. In the screenshot (above, right) this is the same route shown on a CAA 1:500,000 map. 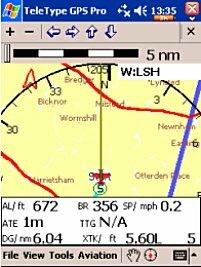 In addition to Headcorn (Lashenden) airport the pilot also has to note the Challock Gliding field adjacent to the second leg. Gliders have priority. After takeoff to the west, which set us initially off course, we made a turn at about 1000 ft and headed on 050 deg in order to meet the planned track to WP1. We continued to WP1 and then re-set a course to Ashford, WP2. The plane direction, brown line, is targeted to converge with the plan, green line, at WP1. The data beneath the map includes height (AL), Bearing (BR), Speed (SP), Time to destination (ATE), distance to next waypoint and to end of planned trip (TTG), Distance to next Waypoint (DG) and deviation from intended course(cross track) (XTK). Halfway to Ashford, after deviating to the south of our planned course to avoid glider traffic at Challock/Charing, and then used the 'Nearest Airport' feature to set a new course towards Manston Airport, callsign EGMH. Zooming out revealed the airport location and the extended runway display (pink line). At this stage we decided to revert to the original plan and re-set the course to LSH, i.e. the NDB for Headcorn. The above illustrations show our progress back to Headcorn, in various magnifications. Teletype proved to be reliable in practical conditions, with useful navigational aids but, for the UK, needs a more comprehensive database and the mapping has limited topographical details. A feature filled and flexible navigation system with excellent potential for drivers and pilots worldwide. 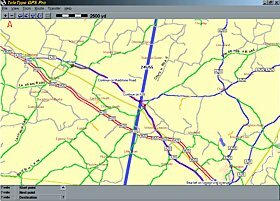 The basic system was designed for the USA and may well provide for excellent route planning in that area. However, for European application some development work still need to be done and we look forward to the next update. The aeronautical system works well but a more complete airport database would significantly enhance practical application. Please note a full in-depth TeleType Street Navigation review will be made available separately in our Street Routing Reviews menu.